Too busy to take your car to a mechanic? 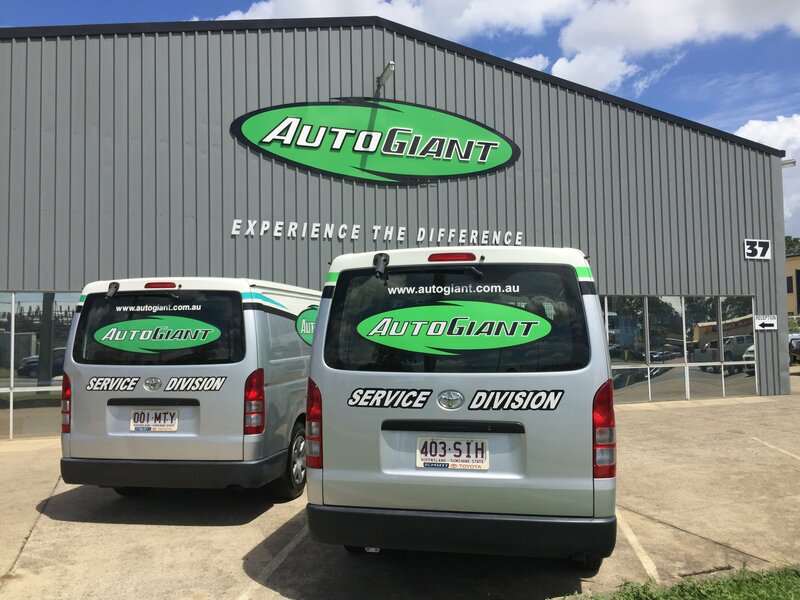 At Auto Giant, we have a fully equipped Mobile Service division conveniently providing clients in the northern suburbs of Brisbane with access to our services at your home or place of work. Our roadside service is designed to get you back motoring again with minimal fuss. When booking a north Brisbane mobile mechanic with Auto Giant, you can always expect our mechanic to service or repair your vehicle in a professional and timely manner and get your vehicle back on the road in optimal condition. Bookings are essential. Call us on (07) 3881 2900 to book in your mobile car service or mobile car repair today! You can’t beat the convenience of having a local (north Brisbane) mobile car mechanic come to you to fix or service your vehicle. Whether your car is at home or at work, just sit back and relax knowing our mobile mechanic will arrive on time to repair or maintain your vehicle to the highest standard. Simply choose a time, day and address when making your booking and our mechanics will turn up at your location with all the equipment they need to maintain or repair your car. To book an Auto Giant mobile mechanic, simply call us on (07) 3881 2900. Why Choose a Mobile Car Service from Auto Giant? Think about how much time you will save in your busy day by choosing Auto Giant mobile car mechanics to service your car. Not only is this the ultimate level of convenience, but you can also expect the same reliable and high-quality vehicle servicing and repairs you’ve come to expect from Auto Giant. Don’t settle for second best when choosing a mobile mechanic. At Auto Giant, we pride ourselves on setting a high standard of service and professionalism. You can always trust that an Auto Giant mechanic will be highly professional when arriving at your home or workplace to service your vehicle. All our mechanics treat the car and the premises they’re working at with the utmost respect and care. Along with having a strong work ethic, every Auto Giant mechanic has the know-how to service and repair your vehicle with over 25 years’ and 100,000 hours of experience. We’re passionate about cars and we put that passion into practice by delivering high-quality car servicing and repairs every time. Whatever make, model or year your vehicle is, our mechanics will have no issues getting to work on your car. We always try our best to go above and beyond for our customers to deliver a high level of satisfaction every time. By expanding our high standard of workmanship into a mobile service, we hope to continue exceeding the expectations of our customers. Are you in need of a minor service to check that all the essentials in your car are working properly, change your oil, oil filters and complete a few small jobs? Or perhaps you need a major service that could also include air conditioning, lubricant and brake services? No matter how minor or extensive your car servicing needs to be, our mobile service units are up to the job. We bring all the essential tools with us in our van to complete all maintenance work on both automatic and manual vehicles. We will service your entire vehicle from top to bottom with the same level of quality and precision you’re used to from Auto Giant. Our mobile mechanics can complete a wide range of repairs on both automatic and manual vehicles. Whether you need to replace spark plugs, a catalytic converter or ignition coils, at Auto Giant, we only use genuine parts for all mobile car repairs to ensure your vehicle will still be covered by warranty. Is there something wrong with your car but you’re not sure what could be causing the problem? Our mobile units can come to you, check out your vehicle using sophisticated diagnostic equipment, find the source of the problem and fix it. If we’re unable to fix the issue in your vehicle with our mobile auto repairs service, we will be in touch to arrange an ideal time with you to bring the vehicle into our shop. We can even arrange to pick up and drop off the car for you! Can’t Drive Your Car? Our Mobile Auto Mechanic Can Help! Does your car not start or is it not fit to drive? Our local mobile car mechanic service is the perfect option for you! When you’re unable to bring your car into a mechanic or if it’s unsafe to drive the vehicle in its current condition, the only option left is to have a mechanic come to you. Contact us today to take advantage of our top quality mobile auto repairs service, and we will do everything we can to get your vehicle back on the road in top condition. Looking for a quality North Brisbane Mobile Mechanic? Don’t leave it too late to get your vehicle serviced or repaired just because you don’t have enough time to visit our workshop. Book mobile car servicing and repairs with Auto Giant instead! Bookings for our mobile car service are essential. Call us today on (07) 3881 2990 to lock in your mobile mechanic appointment. Even if you’re unsure about what might be wrong with the car, give us a call, and we can send one of our mechanics around to conduct a full diagnosis. To get even more benefits from Auto Giant, we encourage you to become a member. It’s free to join and once you sign up, you receive a range of member benefits such as priority servicing as well as a vehicle pickup and delivery service. Become an Auto Giant member today and reap the rewards for future in-shop and mobile mechanic services.